Poster campaign announcing Claude Closky’s retrospective at MAC/VAL Musée d’Art Contemporain du Val-de-Marne. Three sizes of posters were produced: small (80 x 60 cm [31 1/2 x 23 5/8 in. ]), medium (120 x 80 cm [approx. 4 x 2 1/2 ft.]), and large (300 x 246 cm [approx 10 x 8 ft.]). 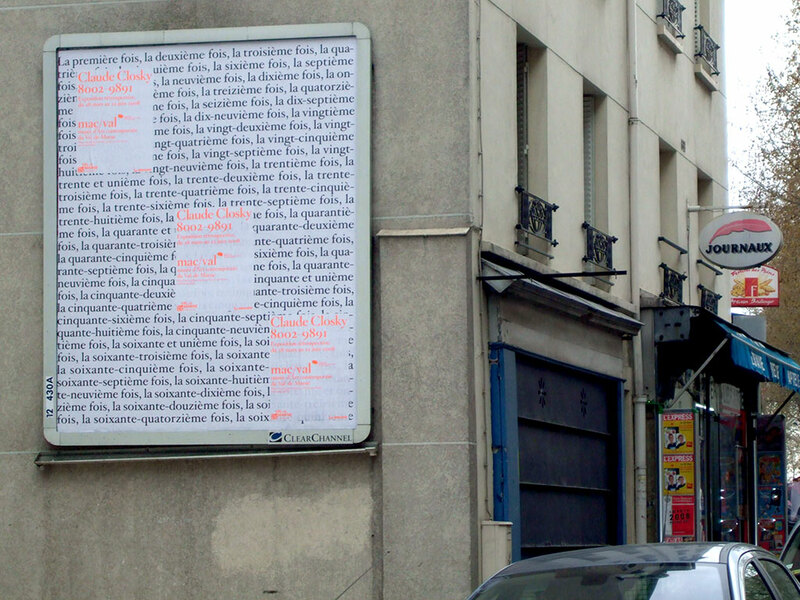 Printed in fluorescent orange ink, the small and medium posters contained all the information about the exhibition. Printed in black, the text on the large poster is from one of the works in the exhibition. While the small and medium posters could be used independently, the large poster was combined with one or several of the smaller posters randomly glued on top of it. The typeface and general design was the same as for the exhibition catalog.